From H-Town and beyond, Astros fans gather each season to watch their beloved team. 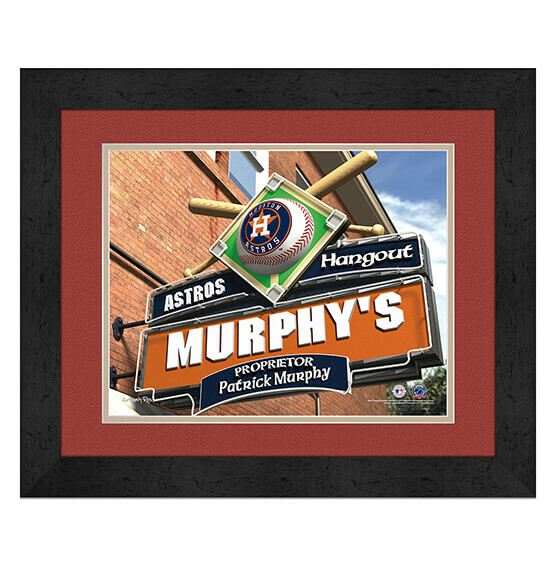 Spruce up your home, office or fan cave with our easily customizable Houston Astros Personalized MLB Pub Sign Framed Print. Purchase for yourself or the Astro fan in your life! It makes a great birthday, anniversary or holiday gift — one that will undoubtedly be a home run in the recipient's book. This generously sized print looks great anywhere thanks to its high-quality MDF vinyl-wrapped frame, glass and heavy-duty paper. It features official Houston Astros logos, colors and whatever name(s) you specify to be added to the "sign within the sign." You'll appreciate that this piece comes conveniently ready to hang. Frame measures 14" by 18"